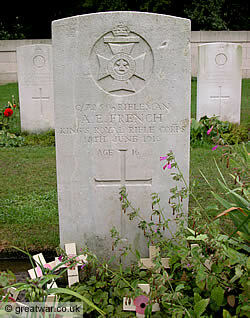 Grave of Rifleman Albert Edward French. The grave of Rifleman Albert Edward French (1900-1916) is often visited in the cemetery located at “Plugstreet Wood” where he lies buried. Young visitors in school groups are especially drawn to visit Albert because he was a sixteen year old at the time of his death on active service. Albert was 16 years of age when he was killed on 15th June 1916. He was serving with the 18th (Service) Battalion (Arts and Crafts) Kings Royal Rifle Corps. Edward French: Head of the household, widowed, and aged 47. Edward was a drilling machinist at the Railway Works. This would most likely have been the Wolverton Railway Works, the largest railway carriage works in Great Britain. Jane French: Edward's sister. Jane was single, aged 40. Presumably she was living with the family at this time to help Edward, who had lost his wife, with the four children. May (Gladys): daughter of Edward. She was 14 years old and was working as an envelope maker in a printing works. Albert (Edward): son of Edward. Albert was 11 years old and at school. William: son of Edward, 8 years old and at school. George: son of Edward, 6 years old and at school. Albert's mother was Mary Ann Amelia Mortlock. She had married his father in 1895 when she was 23 years old and he was a little older, aged 30. She is recorded on the 1901 Census of England & Wales living as the wife of Edward with daughter May, aged 4, and son Albert, aged 1. It is, therefore, presumed that Albert's mother passed away between the recording of the 1901 and 1911 Censuses. 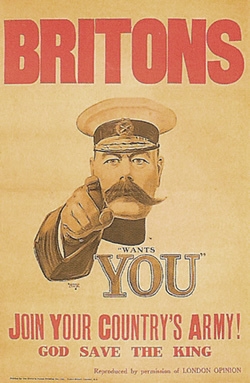 Alfred Leete's highly successful recruiting poster “Lord Kitchener Wants YOU”. Albert French enlisted with the British Army in October 1915. Fortunately Albert's British Army Service Record (2) has survived as one of only 40% of the six million or so British Army Service Records that were not destroyed by bombing on London in the Second World War. The Attestation Form in his Service Record shows that he enlisted as a volunteer on 18th October 1915 at St. Pancras in London. As for all recruits wishing to join up, he was cautioned according to the Army Act that on completion of the form he would be punished if he made any false declaration on it. It is presumed that Albert knowingly exaggerated his real age of 16 to the age of 19 so that he would be accepted for the Army, despite being officially under age to join up and serve in a theatre of war. Albert stated at that time that he was living at 60 Young Street, Wolverton, Buckinghamshire. He confirmed that he was 19 years old and his trade or calling was stated as “Labourer”. His father, named as his next of kin, was Edward French, living at 60 Young Street, Wolverton, Buckinghamshire. Albert was 5 feet, 3 and 7/8 inches in height (approximately 1.61 metres). He weighed in at 105 pounds (approximately 47.5 kilograms). When fully expanded his chest measurement was 32 and 1/2 inches (approximately 82.5 cms). The range of his chest expansion was 2 inches (approximately 5 cms). His physical development was stated as “good”. As a “distinctive mark” he had a scar on his left thumb and under his right shoulder blade. It is interesting to consider that Albert clearly claimed to be 19 years old, but from his physical attributes given above, he would appear to have been a slight, slim young man. It is perhaps surprising that he made it through the enlistment process as he may indeed have looked younger than the 19 years he claimed to be. Did his father know that he had joined up? A WW1 Veteran, Charlie Young (served with The Royal West Surrey Regiment, The Queens), used to tell of how he had joined up under age and got through the system as far as the training depot he was posted to before a letter arrived there from his mother, saying he was under age, and he was sent back home! Charlie later joined up when he came of age and served on the Somme battlefields in 1916 and the Ypres Salient battlefields in 1917 through to the end of the war. Charlie lived into his 90s. Posted to 18th Battalion, K.R.R.C. On 21st October 1915 Albert was at Gidea Park, Essex. This was the location where the 18th Battalion had been raised privately from June 1915 by the lawyer and Member of Parliament Major Sir Herbert Raphael. Albert was formally signed up as a recruit with the Service Number C/7259 and posted to the 18th (Service) Battalion the Kings Royal Rifle Corps (K.R.R.C.). In the same month that Albert enlisted the 18th Battalion was moved to Witley in Surrey, forming one of the units in the 122nd Brigade in the newly formed 41st Division of Kitchener's New Army. On 29th March 1916 Albert's Service Record shows that he received vaccinations in preparation for service overseas. On 2nd May 1916 Albert's Service Record states that he was posted with the 18th Battalion Kings Royal Rifle Corps (K.R.R.C.) to the British Expeditionary Force (B.E.F.) serving in France. The 18th Battalion sailed across the English Channel to the French port of Le Havre, disembarking there on 3rd May 1915. On 15th May 1916 the Service Record states that Albert was punished with “C.B.”, that is, he was “Confined to Barracks” for three days for being caught by Sergeant Ferguson with “dirty equipment on parade”. On 15th June 1916 Albert was reported as having been “Killed in Action”. He died in a part of the British Front Line sector in Belgium near Ploegsteert Wood, just north of the French border. Albert had only been in the Theatre of War for 44 days. Some of those days had been spent travelling and marching from the French coast to the battle area near Armentières. According to his Service Record as outlined above, we can account for at least three of those precious 44 days when he was “Confined to Barracks” for his punishment. Albert is one of only three casualties from 18th Battalion Kings Royal Rifle Corps (K.R.R.C) to be killed in action during June in this location, and to be buried in the Hyde Park Corner (Royal Berks) Cemetery. The other two casualties were Corporal George James Boonham, No. C/6695, aged 22 and killed on 13th June, and Rifleman George Albert Brett, No. C/7101, aged 20, who died a few days after Albert on 19th June 1916. Example of a Next of Kin Memorial Plaque sent to the families of British Servicemen and women who died as a result of their involvement in the First World War. From 1919 and for a few years after the war the British Army records office posted forms to the named next of kin in a deceased soldier's record. This was so that the address details and living next of kin could be confirmed in order that a Next of Kin Commemorative Memorial Plaque and Scroll could be sent to a relative of every casualty who had lost their life in the Great War from 4th August to 30th April 1919. The Next of Kin Memorial Plaque and Scroll was a project set up by the British government from 1916. The plaques and scrolls went into production from December 1918. Over 1 million were issued to families of deceased United Kingdom Forces and Dominion Forces Servicemen and women whose deaths were directly attributable to their service in the First World War. Albert's Service Record includes Army Form W.5080, which was the Army Form completed by a soldier regarding his details of next of kin in the event of his death. sister May Gladys aged 22. Interestingly, his brother William was actually 8 years old in 1911 and George was 6 in 1911. Albert should have stated their ages correctly as being 11 and 9 respectively in 1914, not 16 and 15. His sister May was actually 17 years old in 1914, not 22 as he stated on Form W.5080. As a result of Albert's death in the Army this Army Form W.5080 was sent after the end of the war to his father, Edward French, at 60 Young Street. The same form for next of kin was sent to many thousands of homes across the United Kingdom. In the Service Record documentation Albert's father Edward can be seen to have returned the form having signed it at his home town of Wolverton on 25th July 1919. His signature was witnessed by a Mr S M Wheeldon, Justice of the Peace for the County of Buckinghamshire. This form was then used to send out the Next of Kin Memorial Plaque and Scroll to Mr French. Albert's Service Record documents include the pre-paid Army form returned by Mr Edward French to acknowledge his receipt of Albert's Memorial Scroll on 3rd August 1920. Presumably he also received the Memorial Plaque, which was sent out separately. British WW1 Campaign medal set: British War Medal and Victory Medal. 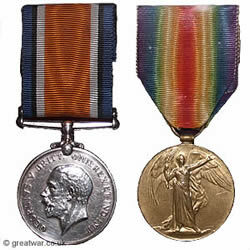 For his service in a Theatre of War from his entry into it in May 1916 to his death, Albert was eligible for two campaign medals: the British War Medal and the Victory Medal. 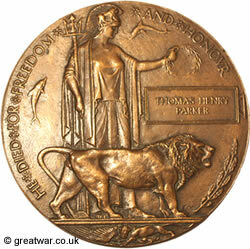 This set of two medals was issued to Albert's father as his next of kin. The set of two medals became known to the returning troops by the nickname “Mutt and Jeff”. Albert's campaign medals were sent to Mr French. Albert's Service Record includes a signed receipt dated 21st January 1921 by Mr Edward French for Albert's British War Medal. A second slip is included in the Service Record where Mr Edwards acknowledges receipt of the Victory Medal on behalf of Albert on 10th May 1921. Rifleman Albert E French is buried in Hyde Park Corner (Royal Berks) Cemetery, Grave Reference: Row B, Grave 2.